The 1935 Ford was one of the sportiest and fastest cars of its day. The peppy little Ford V-8 engine was very popular. 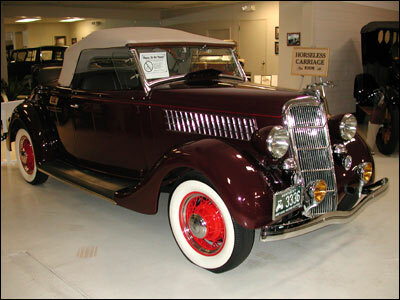 In fact, Clyde Barrow(Bonnie and Clyde) once wrote a fan letter to Henry Ford praising the Ford V-8 because its speed and pick up made it a great get-away car. A copy of his letter has been obtained from the Ford Museum in Dearborn, Michigan and is on display on the next easel. This little beauty is as smooth and peppy as ever. Is it fun to drive? You bet it is!